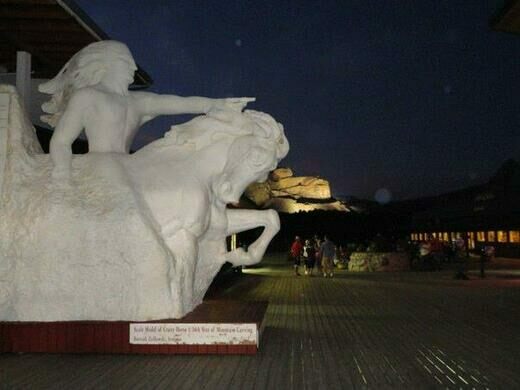 When the carving of Mount Rushmore began in 1927, the local Lakota Indians objected loudly. 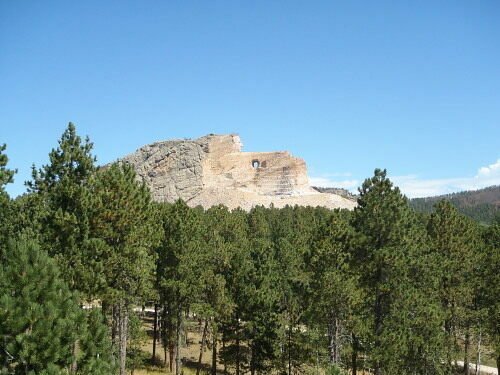 The Black Hills of South Dakota, by treaty, belonged to them. 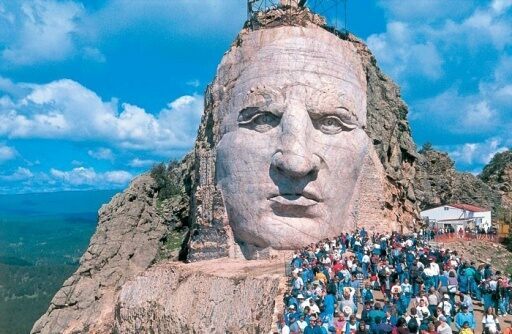 But rather than simply protest, Chief Henry Standing Bear wrote to Korczak Ziolkowski, who had assisted in the carving of Mount Rushmore, and asked him to help the local Native American tribes etch their own heroes into rock. A place where the laws of nature seem to have gone completely berserk... but of course haven't. Every president in history is immortalized in bronze in downtown Rapid City. 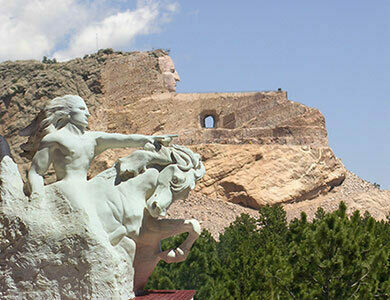 In 1948, Ziolkowski began work on a carved memorial to Crazy Horse, a Lakota war hero who fought and died battling the United States government at the turn of the 19th century. 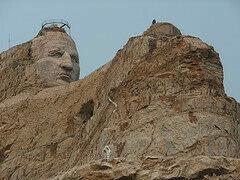 The mountain Ziolkowski was given to carve was located a scant eight miles from Mount Rushmore. 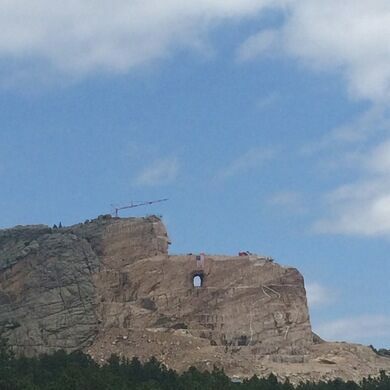 Though Ziolkowski passed away in 1982, work continues on the Crazy Horse memorial. The face of the sculpture, a towering 87 feet, was dedicated in 1998. When completed, the sculpture will stand 641 feet long and 563 feet tall making it the world’s largest sculpture by far. 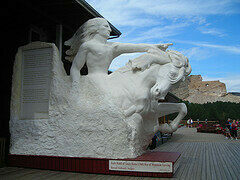 For a size comparison, the head of Crazy Horse alone is 27 feet taller then the six story heads of Mount Rushmore. In fact, if you were to stack all the heads of Mount Rushmore on top of one another they tower of presidential noggins still wouldn’t reach half the height of Crazy Horse. The horse head alone could easily fit two of Lincoln’s inside of it. 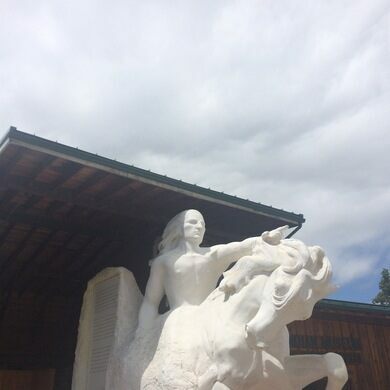 Work continues sixty years after Ziolkowski begun and is currently progressing on the horse’s head. In June, the Memorial hosted an open house where people were allowed on the mountain. As many as 15,000 people showed up. The Indian Museum of North America and the Native American Cultural Center are located nearby, with a large collection of objects that tell the story of the culture, tradition, and heritage of Native Americans. The museum display the flags of all the Native American tribes, as well as a collection of paintings by Andrew Standing Soldier and Hobart Keith, and photographs from the 19th century. 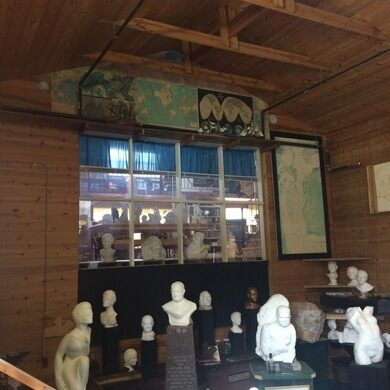 The museum also hosts many cultural activities and offers hands-on experiences to its visitors in the Education and Cultural Center. It cost $30 dollar per car to enter. The highest point in South Dakota contains the ashes of Valentine McGillycuudy, the "Holy White Man." Hidden behind Lincoln's head is a 70-foot-long chamber containing enamel plates documenting American history, sealed in a teakwood box in a titanium vault. Despite repeated attempts to make it work, this former mining town is now nothing but dust and memories. Large Massachusetts museum dedicated to Armenian history and culture.